Alignment and bathymetry of the 63″ intake pipeline for Cornell’s Lake Source Cooling Project. In 1998 Makai was hired by Gryphon International Engineering Services and Cornell University to design a 63″ diameter HDPE intake and outfall pipeline in Lake Cayuga near Ithaca, New York to provide 20,000 tons of centralized cooling for the University. This was a large innovative development for Cornell that made good economic sense, and by eliminating mechanical chillers that used ozone- threatening Chlorofluorocarbons, also made good environmental sense. Makai’s responsibility was for all aspects of the marine design of 63″ intake pipeline from the Heat Exchanger Facility located 300 feet onshore to the intake structure two miles out in the lake and for a 48″ outfall pipeline from the Heat Exchanger Facility to a point 700 feet offshore. The intake design capacity was 32,000 gpm of 5º C water drawn from a 250 foot depth. Custom designed recoverable intake structure for the Cornell intake. 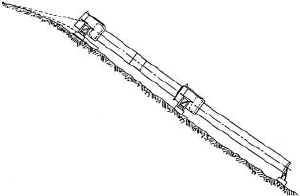 A plan view of the designed pipeline alignment is shown above. The pipeline runs through a tunnel from the heat exchanger facility to the lake shore where it is initially dredged into the bottom to maintain clearance from small boats and winter ice floes. When the pipe reaches water depths of 15+ feet it sits directly on the sediment covered lake bottom making a broad turn to the North as it heads for deeper water. The lake bottom drops off very gradually at first requiring a mile of pipe to reach a depth of 35 feet. Then from this depth the slope increases and the pipe is laid over the most gradual portion of the steeper slope down to the intake depth of 250 feet. This was the first pipeline Makai had ever done in a fresh water lake, and it held several design challenges. 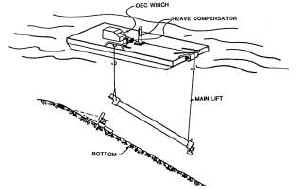 While the currents and waves predicted in the lake were small compared to those experienced in the ocean, they were large enough to require a unique anchoring system to hold the pipe safely due to the weak sediments which cover the lake bottom. Steel shear plates were designed to be coupled to the concrete pipe anchors, and these plates were driven into the bottom after pipeline deployment. Makai subcontracted Haley and Aldrich, Inc. of New York to assist in the geo-technical investigations and onshore aspects of this work. The pipeline design life of 75 years and the concerns for existing aquatic species in the lake required careful design consideration. Makai decided early in the design that it was both prudent and technically feasible to design a recoverable intake structure for this pipeline. This would allow both detailed inspection and maintenance to be performed on this critical portion of the pipeline over its entire service life without the need for decompression diving. The natural flexibility of polyethylene pipe made such a development possible. The last 600′ of pipe were lightly weighted, and the intake structure was designed with special buoyancy modules that could be air-filled to allow it to float on the surface. The intake structure on the bottom is shown above. The intake can be recovered from the surface using a derrick barge or barge mounted winch. In addition, a stainless steel screen structure was designed that can be separately recovered; its purpose was to keep fish and other aquatic species out while allowing large water flows to pass through at minimal head loss. Separate recovery of this screen will allow it to be cleaned of Zebra and Quagga mussel growths when necessary. The deployment of the Cornell intake was challenging because of the large diameter of the pipe and the limited access to the lake for large tugboats. The contractor used Makai’s controlled submergence process to deploy the pipeline in multiple sections. Makai carried out extensive analysis to analyze several possible deployment scenarios and also conducted scaled model tests of the HDPE flange connections to ensure that they could safely withstand the expected bending and tensions during deployment. The pipeline was installed in the Fall of 1999 with final completion during 2000. Makai has designed for the State of Hawaii a larger warm and cold-water intake system for supplying both cold and warm water for aquaculture and ocean energy systems. Makai had full responsibility for the pipelines and pump station from the survey through to the final design plans and specifications. Estimated construction cost of the seawater supply system is 13 million dollars. The 55″ seawater supply system is a dual ocean intake. One pipeline takes in seawater from a depth of 80′ and supplies over 50,000 gpm on shore. A second pipeline, approximately 10,000′ long and extending to a depth of 3000′ brings in 27,000 gpm of seawater at 4 deg C. Each pipeline is 55″ OD and primarily consists of polyethylene pipe. 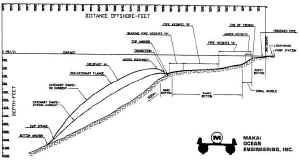 The deep-water pipeline profile is illustrated above. The offshore region had been surveyed extensively with sidescan sonar that showed that the slopes were both steep and very rugged. The sidescan data on the steep and highly reflective slopes in Hawaii was inadequate for the detail required in a pipeline design. Makai surveyed the seabed with a high-resolution acoustic bottom roughness survey system to determine roughness resolution as fine as 6 inches. By knowing the capabilities, limitations, and costs of various polyethylene pipeline approaches (see the design approaches discussed below covering bottom, catenary, and pendant pipelines), an acceptable route and design approach could be joined. The resultant design was a pipeline that lies primarily on the seafloor, missing known obstacles. In the region of 500′ to 1600′ depth, the seabed is quite rough with old lava flows and ledges. The pipeline has been designed to be pulled tight over this region where it can span above the rough seabed due to the concave nature of the bathymetry. A series of pendants attached to the pipeline in this region help restrict movement due to high currents. 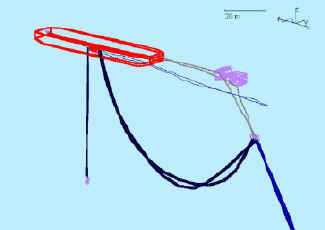 A final survey was conducted with a series of submarine dives confirming the route and location of specific obstacles. The deployment of the 55″ pipeline is to be completed by the controlled submergence process developed by Makai and used previously on deep-water pipelines ranging in size from 12″ to 40″ (see sections 6.2, 6.3 and 6.4). The primary difference for this pipeline is that it will be installed in one continuous section and will reach a depth of 3000 feet. By extrapolating from the success of earlier pipeline deployments, this larger and longer pipeline can be safely deployed to this greater depth. The near-shore portion of this pipeline was particularly challenging because of the strict environmental constraints limiting trenching and the very extreme design waves (48 feet) and strong surface currents. Because of the large diameter of the pipelines, any surface mounted pipe would experience extreme inertial loads. Tunneling approaches were investigated: both slant drilling and micro-tunneling. Slant drilling was not contractually feasible, not being able to obtain a firm fixed bid from any contractor. A micro-tunneling approach was used and the design completed. Twin tunnels cross the shoreline from the pump station 500′ inshore to the breakout 500′ offshore at a depth of 80 feet. The tunnels are steel tubes with concrete carrier pipes grouted in place. The construction of this portion of the pipeline has been completed. The warm water intake structure and the offshore cold water pipe attaches to the tunnels at 80′ depth. The deep-water portion of the pipeline is primarily gravity anchored with the exception of the immediate shallow region that has additional screw anchors for added stability. The intake structure likewise is stabilized with screw anchors. The pump station is on shore, approximately 500′ back from the shoreline. Two pumps for each pipeline provide for the full flow, a third pump is installed for each pipe as a backup. The cost of installing large sumps in the very porous soil at Keahole, Hawaii prompted the design approach illustrated below. The large intake pipelines are located well below grade and open into an inlet screen well that separates any debris from the incoming seawater. From that point, the water flows to three individual wells, each with a vertical turbine pump, accessible from the surface. Sinking these pre-fabricated well structures in a flooded pit proved to be a more economical approach than the conventional large sump structure. At present, the design is complete and the near-shore twin tunnels have been constructed. The remainder of the pipeline has been funded and is scheduled for construction in 2000 – 2001. The state of Hawaii is developing a Hawaii Ocean Science and Technology (HOST) Park on the Island of Hawaii to provide land and resources to developing companies in aquaculture and energy. The HOST park includes seawater supplies, both warm and deep cold water. Makai was responsible for the design of the offshore pipelines. The intake cold-water pipeline was one of the most formidable engineering and construction challenges for the HOST Park development. The pipeline design called for a total flow of 50,350 lpm (13,300 gpm) of deep, cold water at 5 to 6 degrees Centigrade (39-43°F) from a depth greater than 640 m (2100 ft). The pipeline was designed to withstand a 100-year storm and have a lifetime of 10 years or greater. Because the final use for the cold water is to be for aquaculture and OTEC research, the pipeline materials contacting the flowing water must be inert. The bathymetry at Keahole is ideal for a down-the-slope deep-water intake pipeline. The bathymetric profile and the pipeline installation is illustrated above. The desired intake depth of 640 m (2100 ft) is less than 1.6 m (1 mile) offshore. The shore elevation is approximately 3 m (10 ft) with a basalt cliff at the shoreline. In the shallow water are boulders with occasional bedrock outcroppings. At a depth of 15 m (50 ft), approximately 92 m (300 ft) offshore, to a depth of 61 m (200 ft), the bottom is coral rubble with slopes up to 40 degrees. Between the depths of 61 m (200 ft) and 152 m (500 ft) the bottom is smooth with sand and small pebbles. At 152 m (500 ft) the bottom slope abruptly increases along an old reef. The slope becomes 40 degrees or more at greater depths and the bottom is covered with old lava flows and occasional boulders 3 m (10 ft) or more in diameter. At the pipe intake area, the bottom is lightly sediment covered and smooth at about a 25 degree slope. Keahole Point, being the western most point of the island of Hawaii, frequently has strong currents. The 100 year design currents are 2.9 m/s (9 ft/s) at the surface, 1.3 m/s (4.2 ft/s) at 152 m (500 ft) and .4 m/s (1.3 ft/s) at 305 m (1000 ft) and below. In addition, the pipeline has been designed for a 100 year storm wave at 14.5 m (47.5 ft) ft high at 18 seconds in the open ocean. Extreme wave and current events have been combined to yield a 100 year maximum load expected on the pipeline. In the shallow water, the pipeline loads are wave dominated and in the deep water they are current dominated. 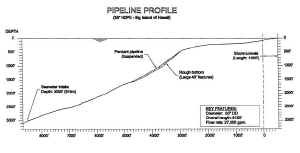 The pipeline profile illustrates the general design approach used for this pipeline. The pumps are located in a sump 76 m (250 ft) inshore of the shoreline. From the pump station to 92 m (300 ft) offshore, the pipeline is buried. From a depth of illustration A1 21 m (70 ft) to a depth of 152 m (500 ft), a distance of 640 m (2100 ft), the pipeline is held just off the bottom with concrete anchors clamped to the pipeline. Beyond 152 m (500 ft) depth and reaching to the bottom anchor at 701 m (2300 ft) depth, a continuous band of polyethylene pipeline, 1030 m (3377 ft) long, freely floats above the bottom. This long, inverted catenary is held in place with two large gravity anchors at either end, 36.3 t (40 tons) at the top in 152 m (500 ft) of water and 18.1 t (20 tons) at 701 m (2300 ft). Polyethylene had been selected as the pipeline material for this project. Polyethylene has significant advantages for this pipeline in that it is inert and will neither corrode nor contaminate the cold water. Polyethylene links can be heat fused together to form a long continuous pipeline with joints that are as strong as the pipe itself. With its excellent strength and flexibility, deploying a polyethylene pipe is far easier then other materials. Furthermore, the polyethylene is buoyant in water, a characteristic that provides for a great deal of design flexibility and deployment ease. The lower portion of the pipeline is an inverted catenary, 1030 m (3377 ft) long, which floats several hundred feet above the steep bottom. 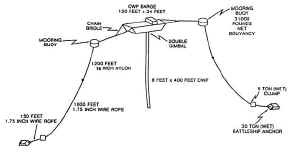 This catenary design has been used to avoid contact with the rough and generally unsurveyed bottom beyond 152 m (500 ft) depth. The buoyancy in the inverted catenary is provided by the buoyancy of the polyethylene material plus, in the shallow region of high currents, fishing floats attached to the pipe. Even with this buoyancy, the pipeline sways in the strong currents at Keahole. Under 100 year current conditions, the center of the catenary will move nearly 152 m (500 ft) horizontally and 76 m (250 ft) vertically. Under moderate and strong current conditions, there will be vortex shedding on the pipeline and the pipeline may or may not resonate. Even if the pipeline does resonate, the cyclic fatigue limitations of polyethylene material will not be exceeded. At the top of the inverted catenary the pipelines moves through the transition region to become a fixed anchored pipeline. The transition is a critical area of the pipeline becauset it is loaded by two dimensional bending, very high tension and torsion due to the buoyancy and movement of the catenary. At 152 m (500 ft), the catenary loads are transferred through a external pipe clamp to a mooring line attached to the upper 36.3 t (40 ton) anchor. Therefore the bending is taken by a relatively unloaded portion of the pipeline. The bottom anchored pipe stretches between the depths of 152 m (500 ft) and 21 m (70 ft); it is 640 m (2100 ft) long. Pipeline anchors, with a wet weight of 3062 kg (6750 lbs), are clamped at varying intervals along the pipeline. The anchors support the pipeline 0.75 diameters off the bottom in order to minimize hydrodynamic loading and to clear small obstacles on the bottom. The spacing between weights varies since the loading and anchor requirements diminish in the deeper water. The installed pipeline in this region has an in place weight varying from 205 kg/m (138 lbs/ft) at 152 meters (500 ft) to 1235 kg/m (830 lbs/ft) at 21 m (70 ft). The very high weight per ft in the shallower portion of this region was achieved by adding saddle weights to the pipeline after it was placed on the bottom. 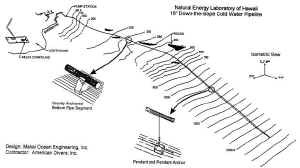 The shallow portion of the pipeline is buried. The buried pipe stretches from the 21 m (70 ft) depth point, 92 m (300 ft) offshore, through the cliff shoreline and to the pump station, 76 m (250 ft) onshore. The cold water pipe is a long suction intake delivering 50,346 lpm (13,300 gpm) to the submerged pumps onshore. The pipeline operates at 345 kPa (5 psi) suction total, 9.2 kPa (1.33 psi) is due to the static head from the high-density cold water. Because the pipeline suction requirement diminishes along the pipeline, the pipe wall thickness is staggered; the pipeline has a diameter to wall thickness (SDR) of 21 near the pump station and an SDR of 32.5 near the intake. The pump station is within the high surf zone and built entirely below grade. The 8 submersible pumps are installed in a covered sump 7.3 m (24 ft) deep. Three of the pumps feed the Natural Energy Laboratory of Hawaii and 5 feed the HOST Park. The 1 m (40") HOST cold water pipe was assembled and deployed in July, 1987. Assembly of the pipeline took place at Kawaihae Harbor, 35.4 km (22 miles) north of the deployment site. The pipeline was fused together, anchor weights attached, and the assembly floated air-filled in the harbor at Kawaihae. Two separate tows were made to the site delivering first the near-shore portion of the pipeline, over 915 m (3000 ft) long and then finally the latter part of the catenary section, 610 m (2000 ft) long. At Keahole, the pipeline was controllably submerged and placed on the bottom. The first section of pipe deployed was the shore section stretching from 21 m (70 ft) depth to the mid-catenary flange, a pipe length of 1131 m (3709 ft). 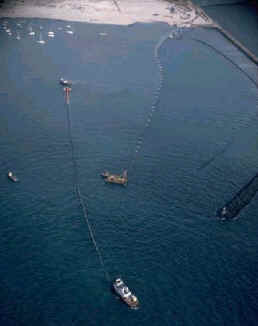 This pipeline, air-filled and floating on the surface, was anchored at the shore end and connected to shore pumps. A large tug on the offshore end pulled the pipeline into alignment. By pumping water into the pipeline at the shore end, the pipeline was controllably submerged to the bottom. The internal pressure in the pipeline was controlled to prevent pipe collapse. By pulling strongly offshore, regulating the flow of water into the pipe and monitoring the air pressure inside the pipe, the pipeline submergence was always in static equilibrium and could be easily controlled. This submergence of the weighted portion of the pipe was a primary consideration in the design of the pipeline. There was a fine balance in the required offshore pull, minimum bend radii in the pipeline, internal pressure on the pipeline, external pressure on the pipeline, point loads on the pipeline due to anchor weights and temperature of the pipeline. The design of the deployment technique was an intricate part of the overall pipeline design. Prior to submerging the near-shore portion of the pipe, the transition anchor and transition attachments were connected to the floating pipeline. The transition anchor was then lowered with the submerging pipeline. Once the transition anchor was placed on the bottom, the deployment of the first section was complete and the end of the first section, 366 m (1200 ft) down the inverted catenary from the transition, remained on the surface. The second and final section of pipe was then towed from Kawaihae to Keahole and the two flanged pipe sections were bolted together on the surface. A pig was pumped through the pipeline to purge it of air, the intake end of the pipeline was attached to the lower anchor and this was lowered to the bottom in approximately 701 m (2300 ft) of water. The 40” diameter deep water intake pipeline was designed by Makai Ocean Engineering and installed at the Natural Energy Laboratory of Hawaii (NELHA) in 1987. Designed for an original life of ten years, the pipeline has been in service for the past 26 years, with many businesses and research groups depending on the cold water supply. The rugged material properties of the HDPE pipe enables unique deployment and anchoring methods, and were utilized in Makai’s original design to deploy the pipe in two stages using a “controlled submergence” technique as well as an extensive floating catenary section to traverse the steep and rocky slopes off NELHA. Overall, the pipeline consists of several zones; a trenched shoreline crossing, a bottom anchored section resting on the seafloor, and an 1100 meter long floating catenary that extends from the bottom anchored section to the intake at 670 meters depth. A transition region at the start of the catenary, at approximately 150 meters depth, was designed to stabilize the pipe in this region. The transition section consists of a large gravity anchor with chains and synthetic lines extending to an offshore holdfast and an HDPE sleeve, a segment of 48” diameter HDPE pipe that slides over the 40” intake pipe. These components restrain pipeline movement as the pipe changes from the fixed bottom mounted configuration to a floating catenary and are critical to support the forces to which the floating pipe is exposed. After several decades, many of the bridles and steel components in the transition section had corroded and eroded, and were in need of repair and replacement. The State of Hawaii contracted Makai Ocean Engineering in 2009 to perform final designs to repair the pipe with the goal to extend the life of the system an additional twenty years. Makai knew that the original construction of the pipe varied from our original design drawings and specifications which caused significant uncertainty in identifying the exact locations of the pipe components. There had also been an important loss of buoyancy and biological growth on the pipe, and the last pipe weight before the transition section had slid down the pipe. These factors dictated the need for a comprehensive approach to the repair design process. Makai developed a numerical model of the pipe using finite element software. To build up the model, Makai utilized original design drawings, as-built records, and an extensive collection of video from several decades of manned submersible inspection operations by the Hawaii Undersea Research Laboratory (HURL). The model was iterated until it could reproduce the existing conditions observed at key points along the length of the floating catenary pipe. Once completed, the numerical model was used to simulate the dynamics of the pipe under various ocean conditions; including a 2.5 knot 100 year design current. The results provided clear evidence of the existing risks to the pipeline and identified critical repairs that were needed. In 2012 a new HURL inspection survey was completed, which allow Makai to more accurately update the model predictions. To formulate the repair design, Makai modified the numerical model to incorporate several different design scenarios. The results showed significant sensitivity to the repair options considered, particularly the relationship between anchor locations and the specified bridle lengths. Makai ran several sensitivity studies, and identified a robust design strategy that could be achieved using a working class ROV and experienced crew. The repair work included addition of new chain lengths, shackles, three new 1.5 tonne syntactic floats, and re-positioning and re-attachment of the 48” restraining sleeve. The model was used to specify the transitional state of the pipeline during intermediate steps in the repair process. Makai provided design drawings based on the findings including several ROV compatible devices to clamp the large buoyancy floats to the existing pipe. Makai Ocean Engineering designed for the Natural Energy Laboratory of Hawaii an 18" back-up pipeline to the 12" pipeline Makai had designed and installed 6 years earlier. This work was performed for the Research Corporation of the University of Hawaii. This pipeline was installed approximately 1 mile south of Keahole Point, Hawaii, the location of the 40" and 12" inverse catenary design pipelines. American Divers, Inc. of Honolulu and Makai Ocean Engineering completed the deep-water deployment in October, 1988. The main restricting design criteria for the 18" pipeline was cost. The State’s budget was limited for construction of this pipeline plus the State wanted to demonstrate new cost savings techniques for the installation of deep-water polyethylene pipes. Compounding this restriction, considerably less was known about the bottom conditions along this pipeline route as opposed to previously laid pipelines and the acceptable pipeline corridor was quite narrow. The above figure illustrates the overall pipeline configuration and shows the primary difference between this pipeline and the preceding inverse catenary design concepts. The very shallow portion of the pipeline, from the shoreline to the depth of 70′, is rock bolted directly the hard bottom with a series of tubular steel supports that are highly versatile and adaptable to the very irregular bottom. Beyond the 70′ depth and out to 500′ depth, the pipeline traverses a fairly smooth but narrow corridor and is held in place with concrete weights similar to earlier designs. Beyond 500′ depth, the design changes are most apparent. The buoyant polyethylene pipe rises above the bottom but is moored with a series of pendants, approximately 40′ long, that are distributed along the pipeline down to the intake at 2100′. There are several design, budgetary and deployment advantages to the pendant supported pipeline configuration. The pipe is supported well above the bottom and therefore an accurate survey for a smooth pipe route is not required. Secondly, some of the disadvantages of the catenary are eliminated: the handling of the large clump anchors at either end of the catenary during deployment is eliminated and the complex transition between the moving catenary and the stationary pipeline is not necessary. Among the disadvantages of the pendant system is the large number of suspended weights dangling during deployment and the pipeline is still somewhat affected by bottom features. Because of the considerable previous experience in handling and laying polyethylene pipelines, it was felt that the pendants could be safely handled without fouling. Included in the development of this pipeline concept were low cost pipe attachments, not requiring heavy steel clamps as used in the past, such that the pipeline could be pulled safely at high tensions. This high tensile load is a requirement during deployment. The full length of this 6000′ long pipeline was laid on the bottom using the controlled flooding and submerging techniques used in the past. This pipeline, however, used this technique to a conservatively greater depth. The pipeline was flooded from the shore end to the offshore end, and the bitter end was lowered with a cable to the sea floor. The submerging and lowering of the pipeline took less then 12 hours. The polyethylene pipe portion of this pipeline was assembled at the Natural Energy Laboratory just prior to the deployment. The pipe was placed on rollers and launched into the ocean through a ramp at the shoreline. As the pipeline was pulled into the sea, pendants, weights and various pipeline components were attached to the pipe near the shoreline. The total launch took approximately 12 hours. The ability to launch a pipeline in this manner demonstrates that a harbor or protected shoreline is not necessary for installing a CWP. 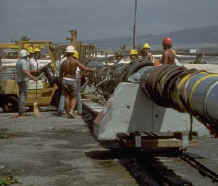 Prior pipelines had used the harbor at Kawaihae for their installation but parallel projects at Keahole made it advantageous to launch this pipeline on site. The relationship between the State of Hawaii, American Divers, the contractor, and Makai Ocean Engineering, the designer, was unique. American Divers was selected to construct the pipeline early in the planning stage. During the design, Makai worked closely with American Divers in order to design a pipeline that could cost effectively be deployed by American Divers and still meet the operational requirements of the State of Hawaii. American Divers worked directly for the State on a time and materials basis and all parties acknowledged that there are significant risks that are inherent with any marine construction, the contractor would work to the best of his ability and the ultimate risk would be taken by the State. One major difficulty with the 18" pipeline route was the location of rocks on either side of the pipe route at depths between 240′ and 600′. Currents at Keahole can be quite high and on the day of deployment exceeded 1.3 knots at times. 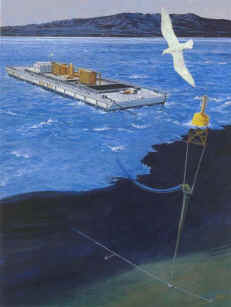 The restricted deployment budget did not allow precise acoustic navigation techniques nor even surface electronic navigation. The pipeline was precisely deployed utilizing shore ranges and restraining lines moored to the bottom at key placement locations. The pipeline was smoothly and efficiently installed in October, 1988. The pipeline was inspected the following December proving that the pipe alignment and pendant arrangement is as designed. In 1998, Makai was contracted by the National Institute of Ocean Technology (NIOT) in Madras, India, for the conceptual design of the deep water intake pipeline, the effluent pipeline, and the mooring system for an experimental floating OTEC Plant. The analysis included dynamic modeling of pipe bending, shown at right. The NIOT OTEC barge is scheduled to be 72 meters long and will be supplied 1415 kg/s of deep cold seawater through a 1 meter diameter pipeline from a minimum depth of 1000 meters. The mooring is 1220 meters deep. In early work, Makai considered several concepts for the pipe and mooring combinations. Basic concepts consisting of multiple point moorings, dynamic station keeping, and single point moors were considered. The design has lead toward a single point moor with the pipeline as a major structural component of that mooring. The pipe is supported at the surface by a large buoy. The OTEC barge can be moored to the buoy and a flexible transfer hose is used to connect the wet sump in the barge to the top of the pipeline below the buoy. The pipeline material used for the main pipe and the transfer hose is high density polyethylene (HDPE). This material is ideal for this application because of its high flexibility, moderately high strength, high fatigue strength, and corrosion resistance. The pipeline was designed for long-term pumping loads, for long-term operational dynamic loads, for short-term storm dynamic loads and deployment. The pipeline and mooring component characteristics were optimized to be suitable under the most severe operating condition (4.25 m significant, 7.3 sec. central period) specified by NIOT and to survive the storm conditions specified by NIOT (8.25m, 12.7 sec). A finite-element dynamic model was used to analyze the pipeline and barge under these and other conditions. The net result of this work showed that a single point mooring for the NIOT barge is a feasible, practical and cost-effective solution to a very difficult and potentially costly problem. Each critical component was analyzed for feasibility and conceptual design specifications have been generated. The mooring and pipeline can be constructed, deployed and recovered with an adequate safety factor, including determination of RMS fatigue stresses at various areas within the same pipe, to meet NIOT’s design goals. The first down the slope pipeline design by Makai Ocean Engineering was for the Natural Energy Laboratory of Hawaii at Keahole, Hawaii. This State of Hawaii laboratory was engaged in OTEC research and required a reliable source of deep cold ocean water in order to perform laboratory experiments on heat exchanger bio-fouling and corrosion. The design criteria for the pipeline called for a low budget, 12" pipeline with a lifetime expectancy of 2 years. Some limited bathymetry and side scan information was available but no on-site observations had been made. Makai’s role in the pipeline was to provide the design, develop the deployment plan, monitor the financing, locate and purchase the materials, be directly in charge of the pipeline assembly and provide technical direction during the at-sea deployment. Because of the very deep bottom with an unknown roughness, the Makai design for the pipeline evolved toward the inverse catenary approach (see 40″ CWP design, a later but similar pipeline). The inverse catenary approach takes advantage of the buoyancy, flexibility and high fatigue strength of the polyethylene material in order to void the primary design problem: a very steep and rough sea bottom. The 12′ pipeline was assembled in a large harbor 20 miles north of Keahole Point. The pipe fusing, attachment of all components, launching into the harbor and testing was completed by Makai Ocean Engineering. Once ready for deployment, Hawaiian Dredging & Construction served as marine contractor to tow the pipeline to Keahole Point and place it on the bottom. The basic controlled submergence process used in all the pipelines at Keahole was developed with this first, 12" polyethylene pipe. On the first day of deployment the pipeline was submerged to the bottom to a depth of 500′. On the second day, the catenary portion of the pipeline was added and lowered to the bottom. Inspection of the 12" pipeline first occurred on its one year anniversary. The pipeline was accurately placed and was functioning well. After over 10 years, this pipeline (designed for two years) was still providing water to NELH. No maintenance had been required in the deep water portion of this pipeline. Only in the shallow water have the anchoring clamps needed replacement and the pumps have been changed. After approximately 12 years, a shackle at the base of the catenary gave way due to corrosion and the catenary was shortened and redeployed in shallower water. At the time of installation, the catenary concept was a radical deviation from conventional pipeline design. Today, because of the 12" pipeline success and longevity, the catenary approach is generally considered as a viable contender for very large diameter OTEC pipelines. Makai Ocean Engineering served as the primary design engineer for the Phase 3 portion of the OTEC Cold Water Pipe At Sea Test Program. Makai was a subcontractor to Hawaiian Dredging & Construction Company, the prime contractor, on this federal Department of Energy research program. The primary purpose of this study was to instrument, deploy, monitor and analyze an 8-foot diameter test section of a fiberglass reinforce plastic (FRP) pipe on underwater foundations along a 40 degree slope. This deployment was completed in May 1984 and marked the beginning of a 12 month data gathering effort to provide information critical to design of large diameter CWPs for shelf mounted OTEC plants. Following this monitoring period, Makai analyzed the data. The figures to the right illustrate the in-place pipeline and the assembly process. The demonstration and goal of this project was to develop a down-the-slope pipeline concept utilizing an existing FRP pipeline and to deploy it on a specific coral rubble 40o slope off the Big Island of Hawaii. While the test section of pipe installed was placed in shallow water, the techniques used were applicable to much deeper water. The joints were easily coupled underwater utilizing remote sensing techniques (video) without divers. This coupling technique was developed for deeper water and was actually more difficult, yet successful, in the shallow water demonstration because of barge surge and heave. A large FRP ball joints allowed the pipe to rotate or bend to accommodate an irregular bottom. The joint acted as a seal for the pipeline. The seal was completed by pumping tremie concrete into the pipe joint connector after it was placed on the bottom. The lowered connector was the form. The joint was also the gravity anchor. The concrete greatly increased the weight and stability of the joint foundation but did not restrict the swiveling or rotating motion of the pipeline. By adding concrete later, the lowering weight was reduced considerably. The deployment demonstrated the successful handling of very large masses and the precision coupling of these masses utilizing only video camera feedback to the deployment superintendent on the barge. The installed pipeline section is still in place having survived several severe storms thus showing the use of large gravity anchors on a steep coral rubble slope. A second goal of the program was to utilize the installed 8′ diameter pipe as a test sample to measure hydrodynamic loading on a large diameter slope-mounted pipeline. Appropriate hydrodynamic data for a pipeline of this size could not be obtained in a laboratory or at reduced scale. Makai designed into the pipeline an instrumented mid-section test ring which actually "floated" in the center of the pipe supported only by a series of load cells. Other load cells were installed at the end of the pipe section in order to measure the wave and current loads on the entire length of pipe. In addition, multiple current meters and wave sensors were added to record the environmental conditions under which the pipeline loads were measured. Makai, in association with Edward K. Noda and Associates, reduced the data from this program and determined pipeline drag and lift coefficients. Mini-OTEC was a joint partnership program of the State of Hawaii, Lockheed Missiles and Space Company, Alfa Laval Thermal and Dillingham Corporation to develop and operate the first closed-cycle self-sustaining OTEC system operating at sea. Its purpose was to prove the feasibility and usefulness of OTEC as an alternative non-polluting power source. Makai Ocean Engineering designed the mooring, the cold water pipe, the water supply systems and the deployment process. Makai was a subcontractor to Dillingham Corporation during this work. The Mini-OTEC facility is illustrated to the right. A small, complete ammonia-based OTEC facility was mounted on a small barge moored 1-1/2 miles offshore. A 2150′ long, 2′ in diameter polyethylene pipe served as the cold water intake for this facility. Makai was responsible for both the intake pipeline and the mooring. Initial concepts involved single and multiple point moorings with a separate pipe; keeping the pipe free from fouling on the mooring was a difficult problem. Makai selected polyethylene as the ideal pipe material for this application and, appreciating polyethylene’s strength and flexibility, the final solution was to use the polyethylene pipe as the actual mooring member. This required the development of a very rugged and reliable end attachment to the polyethylene pipe that would transfer the axial loads of the deployment and mooring. Makai successfully designed and tested these attachments which have subsequently been used in several down-the-slope polyethylene pipe installations. Mini OTEC was deployment in July, 1979 and became the first successful at-sea OTEC plant the following month by producing net OTEC power. In the following year, the National Society of Professional Engineers awarded Mini-OTEC as being one of the ten outstanding engineering achievements of that year in the United States. Makai Ocean Engineering served as subcontractor to Hawaiian Dredging & Construction Company in the suspended pipe test phase of the OTEC Cold Water Pipe At-sea Test Program sponsored by the Department of Energy. During this program, an 8-foot diameter, 400′ long sandwich wall fiberglass reinforced plastic (FRP) syntactic foam configuration CWP test article was developed, constructed, deployed and used for data acquisition in the open ocean near Honolulu, Hawaii. This instrumented CWP was suspended from a moored platform in the spring of 1983. The CWP represented a scaled version of a 40-megawatt size CWP structure, nominally 30′ in diameter and 3000′ long. Makai Ocean Engineering’s role in the program was to assist in the FRP design and planning, plan the pipeline deployment, design and plan the deployment of the mooring in 1300′ of water and provide general engineering assistance to Hawaiian Dredging. Through this program Makai gained valuable experience with FRP pipelines, handling of large diameter rigid pipe sections and the hydrodynamics of large pipelines. This same FRP pipeline was later used in a down-the-slope research program that was also funded by the Department of Energy.